In line with their continued mission of “creating a new cycle of health in America, starting with the youngest generation,” CycleHealth came to d.trio with a new project that encourages kids to participate in self-motivated exercise during their summer break. Much like a summer reading list teachers might pass out to students before the end of the school year, CycleHealth wanted to arm parents and physicians with a goal-setting tool that would walk kids through an entire Iron Man (2.4 mile swim, 112 mile bike ride and 26.2 mile run) over the course of the summer. 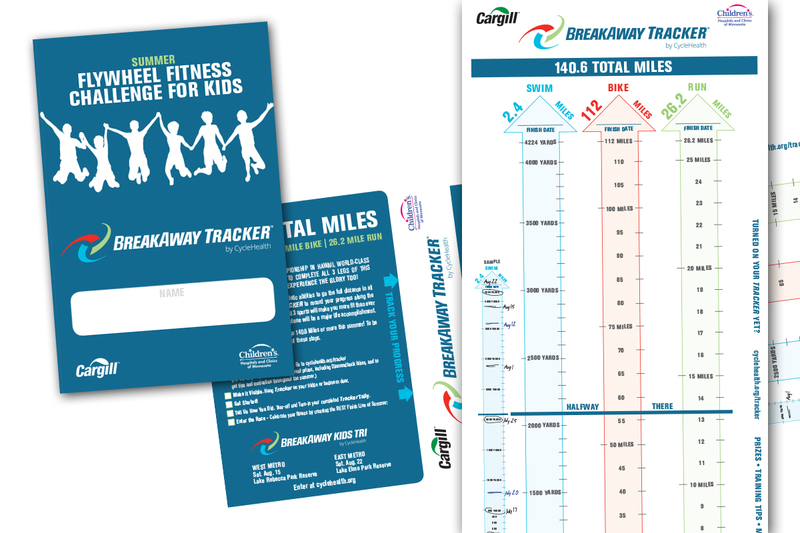 D.trio worked closely with CylceHealth to develop a “Fitness Tracker,” where participants can pencil in their completed swim, bike or run on an incremental, fold-out, printed piece. Upon completion, kids have the opportunity to submit their certificate to CycleHealth and the chance to win prizes. You can view the completed Fitness Tracker below! d.trio continues to support this amazing charity and phenomenal cause! For more information on CycleHealth visit cyclehealth.org.